The Cathedral museum is staffed by volunteers and provides an opportunity for visitors to see and appreciate historic photographs, paintings, drawings and artifacts. The museum is open as volunteers are available. Call the Welcome Center at 651.228.1766 for details. Current Exhibit: “Walk through Cathedral History – from 1841"
During the Centennial, the Cathedral mounted an exhibit in the Cathedral, on the lower level and in the museum focusing on artifacts that tell the history of the Cathedral. Several of these artifacts remain on exhibit in the museum, among them: Archbishop Ireland’s death mask, his walking cane, the desk of Msgr. Ravoux. These remain in the museum for the foreseeable future. Visit the museum to see these important artifacts and items in the museum’s permanent collection: a model of the 1841 Chapel of Saint Paul, the cathedra and altar from the third cathedral, photos, documents—objects that have power to connect us directly to the living history of the Cathedral. The exhibit is made possible with the help of volunteers who staff the museum. Call 651-228-1766 to confirm open days and times. 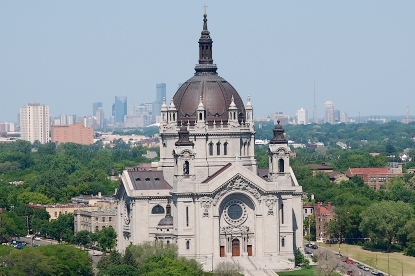 This mission of the Cathedral of Saint Paul Archives is to appraise, identify, preserve and make accessible the records of the history of the Cathedral of Saint Paul and the Cathedral parish. The archives manages historical records by formulating policies and procedures that will ensure the safety and preservation of all archival materials. The archives serve the administration, staff, parishioners, and the general public. The archives is also charged with developing and maintaining exhibits and programs in the Cathedral Museum. 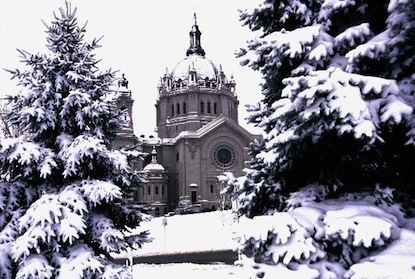 The Cathedral of Saint Paul Archives grew out of a project initiated by the Altar and Rosary Society, now the Women's Association. 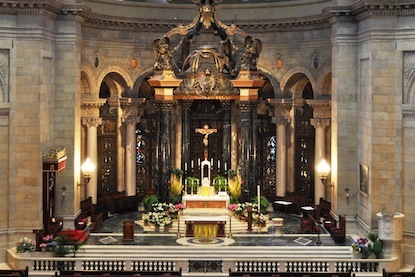 The intention was simply to collect anything that was deemed part of the history of the Cathedral--the building, its construction, embellishment, renovation, and maintenance. They collected the relevant records of the bishops, archbishops, rectors, clergy, and individuals who build, administered, and supported the building. The archives also collected similar documents pertaining to the Cathedral parish. About ten years ago, another volunteer group to over the work of the Archives, sorting and organizing materials so that they could be accessed when necessary and mounting an exhibit of Masqueray's drawings and managing the Cornerstone Centennial Parade. More recent renovation and reorganization of the archives and museum was initiated by Father Joseph Johnson, 21st Rector of the Cathedral. At his request, Celeste Raspanti and Carl Simmons, both parishioners, took on the task. 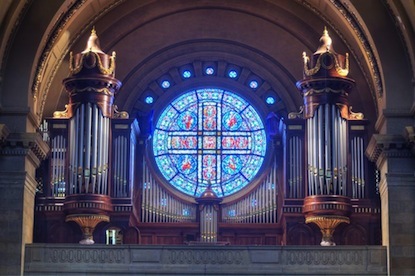 The archive collects the architectural history of the First, Second, Third, and Fourth Cathedrals of Saint Paul, together with the work of the bishops, archbishops and rectors who worked to build and complete the structures. The archives documents the work of the architects, artists, artisans, laborers, and the work of the people who supported the construction, embellishment and renovation of the Cathedral. The documentation includes letters, manuscripts, memoirs, architectural drawings, paintings, prints, photographs and negatives, newspaper clippings, financial records, brochures, programs, transcripts of oral history interviews, and Cathedral memorabilia. The archive also collects the history of the Cathedral parish--its rectors, clergy, parishioners, supporters, and parish groups. 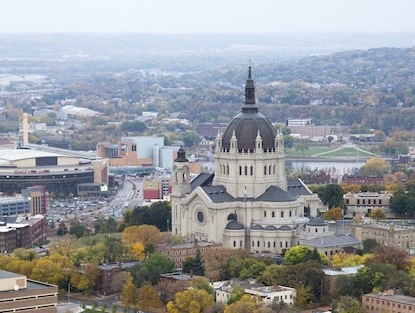 However, the archive does not collect the personal papers of the bishops, archbishops, rectors, and clergy unless these papers pertain to the building, embellishment, or renovation, programs and events relevant to the Cathedral of Saint Paul. The personal papers of the bishops and archbishops of the Archdiocese of Saint Paul and Minneapolis are collected and preserved in the Archdiocesan Archives. The Cathedral archives are not open to general use. They may be accessed with the help of a volunteer by appointment only. Researchers with questions may also contact the archive volunteers for research help.